England has a new mountain for hillbaggers to add to their list. 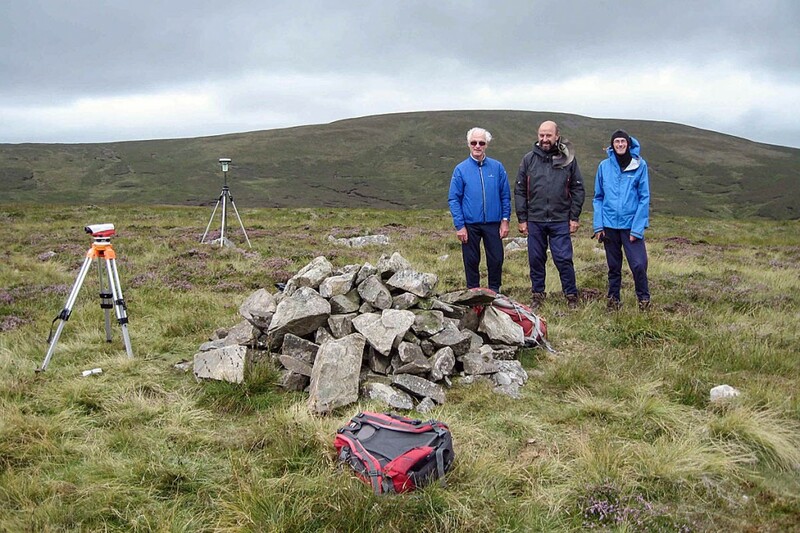 Amateur surveyors John Barnard, Graham Jackson and Jim Bloomer lugged their professional-quality satellite and surveying gear to the summit of two Lakeland fells. 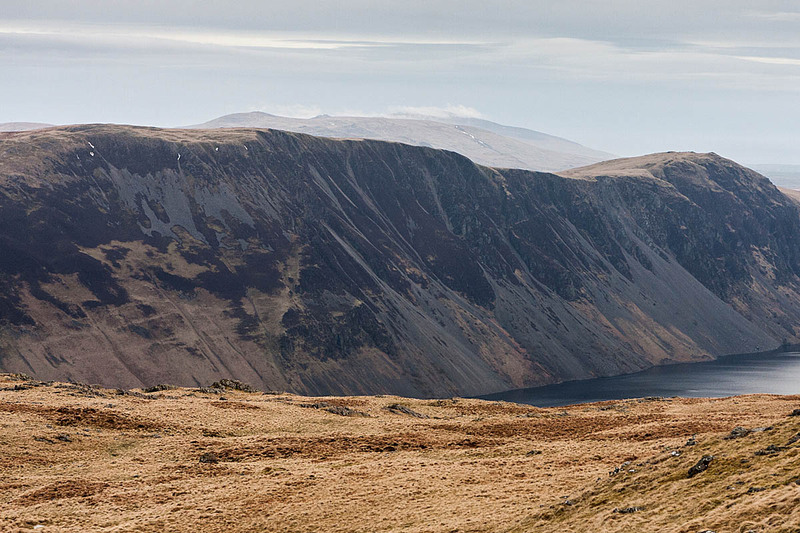 One, Illgill Head overlooking Wast Water, came up short of the required height, but the little known and seldom visited Miller Moss topped the 2,000ft mark. The fell, tucked between Great Lingy Hill and Knott in the far North of the Lake District, was surveyed by the three men and measured up to the designation of a nuttall, a 2,000-footer with a drop of 15m. Illgill Head, on the other hand, just missed out on being added to the list, measuring 608.8m. Mr Barnard said Ordnance Survey has been contacted and has checked the trio’s data and the hill will now have a recorded height of 610m on 1:50,000 and 1:25,000 maps. Here’s the story from the hill sleuths of G&J Surveys. “It was seven o’clock in the morning and an alarm clock in the room across the corridor jolted me into consciousness,” said Graham Jackson. “I poked my head through the curtain of my room to be greeted by sunshine, although the weather forecast of the previous evening warned of rain later in the day. “Jim Bloomer, John Barnard and I had planned to survey Miller Moss for many months and now the time had finally arrived to put that plan into action. After a quick but filling breakfast, we made our way to the end of the Swineside road, just west of Mosedale in the northern Lake District. “The sun continued to shine and a warm breeze met us as we climbed out of the car and collected together our equipment. Others were also tempted on to the hills by the sunshine, as several cars parked nearby gave testimony. “Soon we were following an excellent track to the deserted mine just 500m up the valley. The spoil and an old decayed narrow gauge track were the only evidence of past industry, now long gone and leaving just these remnants as a forlorn reminder. “Surprisingly though, the mine actually only closed in 1981, not long ago for some of us, and was the only source of the valuable metal tungsten outside of Cornwall in the UK. “From here the path climbed the hillside and brought us to a new bothy, a well-maintained wooden hut perched at nearly 600m on the side of Great Lingy Hill. Then it was just 800m of distance over heather to our destination, the summit of Miller Moss. John Barnard takes up the story. “Other visitors to Miller Moss report that a large rock 8m south of the sizeable cairn is the highest point of the fell. Consequently, our first task was to set up our professional surveyor’s level and carry out a detailed survey through staff measurements to find the position of the summit. Jim Bloomer supplied the detail: “To qualify for John and Anne Nuttall’s list of 2,000ft mountains there has to be a minimum of 15m of drop – the height difference between the summit and the col that links it to the next higher hill. “There are two possible cols for Miller Moss; one to the east of the hill links Miller Moss to Great Lingy Hill, while the col to the south-west of Miller Moss links it to Knott. “For Miller Moss to qualify as a new mountain, the drop to both of these cols needs to be 15m or greater. Having carted over 6kg of gear up the hill, I was now keen to get stuck in and make good use of it. “So Graham and I descended to the east col with level, staff and a handful of marker flags to see if we could find its position. We had passed over this area on the way to the summit and we all recognised this was going to be a difficult task. “The col was very broad, being approximately 200m in both the valley to valley and hill to hill directions. Worse still the ground was very uneven and played host to a varied and luxurious flora half a metre thick in places. Graham continued the story: “Having been informed of our proposed survey, John and Anne Nuttall had expressed an interest in joining us and just then they appeared on the skyline above and descended to the col to join us. “At this point John Barnard also appeared on the scene having carried out a reconnoitre of the south-west col. He took great delight in informing us that the second col we would have to survey that day was an even more confusing area than the col we were on. John picked up the story here, explaining that this could be done comfortably within the remaining hour that the Leica Viva GS15 was collecting its data. He lost no time proving this to be true showing his considerable expertise with the method, while Jim did a magnificent job with the staff and Graham stumbled his way through collating the readings. “The line survey was duly finished within the hour, just as data collection by the GS15 was completed, and showed this first col to be 19.7m below the summit, so it made it with 4.7m to spare. But what about col two? “By this time the sunshine had disappeared to be replaced by grey skies heralding a strengthening wind. Looking towards the North we could see that the horizon had begun to dissolve into a hazy silhouette. It appeared that the rain was on its way and compared with earlier in the day, the effective temperature had plummeted. So short-sleeved t-shirts had to be supplemented with more appropriate clothing. Jim took up the story once more: “We lost no time in descending to col two and quickly confirmed that John’s pessimism was well founded. There was a broad flat area that was very wet and vegetated and this area was interspersed with peat hags. “We set up the GS15 at a suitable position collecting data while we investigated the col. We spent a full hour measuring transects across the col in both the valley to valley and hill to hill directions. 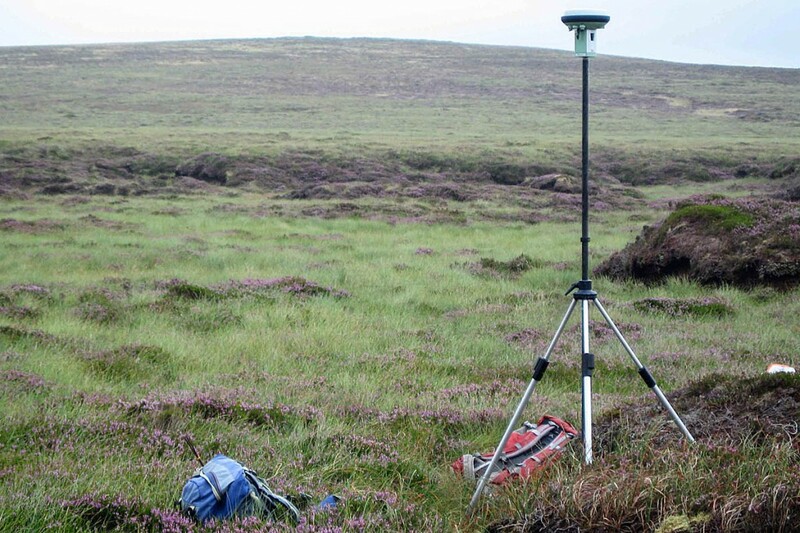 “Our work eventually showed an area within the confusion of bog and peat hags that was the general area of the col. With the level and staff we were able to further narrow this down and determine the col position more accurately to within a relatively small area and finally we measured the height difference between the Leica GS15 set-up position and the col position. “By this time a fine mist of rain had begun to descend, but with the col position located the survey did not now depend on good weather. Finally our task was completed and we could make our way down off the hill. So, what was the result? Well, the height of Miller Moss was found to be 610.1m, so it is over 2,000ft (609.6m). And what of col two? It was found to be 589.9m giving a drop of 20.2m for col two. Miller Moss becomes a new mountain to be added to the list of Nuttalls and the new height will appear on Ordnance Survey maps as the data has already been accepted. It was worth getting wet after all. are we talking about the ring contour at 302 335 or Little Lingy Hill at 304 339? I think it must be 304 339, marked with a height of 609 on my OS Outdoor Leisure 4 and 5 maps. This is west of Great Lingy Hill and north east of Knott, and so matches the description. The OS notes 'a pile of stones' at this point, which could be the sizeable cairn in the description. The 600m ring contour at 302 335 is marked as Little Lingy Hill. This would in my opinion be a better name for the new top than Miller Moss, which is indeed a moss draining eastwards into Grainsgill Beck. What about Frozen Fell and Yard Steel ? Always wondered how mungrizedale common got hill status and they didn’t . Northern Fells are a great place to be . Mungrisedale Common has a prominence of just 2m so isn't a hill in its own right and doesn't appear on any hill lists. The only list it does appear on is the Wainwrights. The Wainwrights are simply places that Alfred Wainwright chose to write a chapter about in his pictorial guides to the Lake District. There is no minimum height or prominence for the Wainwrights. Some Wainwrights aren't hills. Plenty of hills aren't Wainwrights. Miller Moss was listed as 2000ft in The Mountains of Engkand and Wales by George Bridge 1973! That should be 'England' of course! George Bridge's book was ahead of its time in its systematic approach to defining and listing summits. It seems strangely forgotten these days.